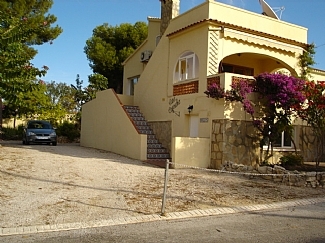 The villa is located near the end of a quiet cul-de-sac within 1 kilometre or a 20 minute walk from L'Ampolla beach in Moraira. Sea views and glorious mountain view of the Sierra Bernia. Elevated sun terrace to enjoy the views and excellent views from the Naya and pool terrace. Substantial garden area with good sunbathing areas around pool and rear of house. Pool size 10m x 5m. Pool shower. All pool and terracing private and not overlooked. Several sun loungers provided. Naya/outside dining area leads onto pool terrace. Saturdays. Villa to be vacated by 10am and arrivals not before 4pm. with bath/power shower, wc, vanity unit with wash hand basin, washing machine. Cooker with fan oven, 4 place gas hob, large fridge freezer, microwave, dishwasher, modern units including large food store. Lounge with 2 sofas. Sky TV, DVD, CD Player, Modern dining suite with table to seat 6. Serving area to kitchen.